Skylight Paths Publishing, 9781683367949, 24pp. For preschoolers--a first lesson in finding your place in God's creation. This simple, beautiful book helps parents and children explore spirituality together by inviting children of all faiths and backgrounds to encounter God through everyday experience and the imagination. 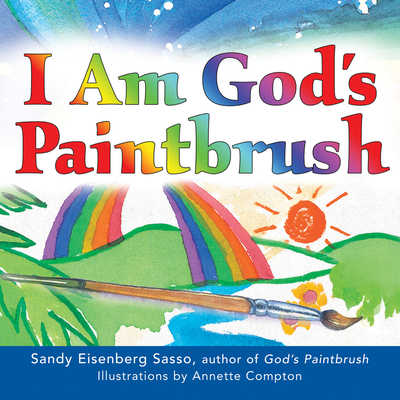 Adapted from Sandy Eisenberg Sasso's award-winning God's Paintbrush, playful text and lively illustrations guide very young children in finding faith through colors, song and dance. Preschoolers will delight in turning the sturdy pages and beginning the journey of finding joy and meaning in their world. Rabbi Sandy Eisenberg Sasso, a parent, spiritual leader and storyteller, is the award-winning author of God's Paintbrush, In God's Name, God In Between and many other inspiring books for children of all faiths and backgrounds. The second woman to be ordained as a rabbi (1974) and the first rabbi to become a mother, she and her husband, Dennis, were the first rabbinical couple to jointly lead a congregation-Beth-El Zedeck in Indianapolis. They have two children, David and Debora, and three grandchildren. Sasso, who holds a doctorate in ministry, is active in the interfaith community, and has written and lectured on the renewal of spirituality and the discovery of the religious imagination in children of all faiths.Rabbi Sandy Eisenberg Sasso is available to speak on the following topics: Nurturing the Spiritual Imagination of ChildrenTell Me a Story: Reading the Bible and the Religious Imagination of ChildrenFilling in the Blanks: How Women Read the BibleWomen and Judaism: A Personal JourneyMidrash as a Tool for Spiritual ReflectionClick here to contact the author.